Dinah Abrams’ love for gardening goes back to her Arkansas roots. As a child, Dinah would spend hours in the garden with her mother, planting, nurturing, and harvesting vegetables to feed their family of seven. Dinah came to Central Texas to help her daughter care for her new baby. However, Dinah fell on hard times, and found herself without a job, a car, or a home. She stayed at a transitional living facility in Austin for three months while she looked for work. Her life started to come together again when she got a call from HACA informing her that an apartment was available at Lakeside Apartments. Since living at Lakeside, Dinah says she’s started attending church again. She’s also started a community garden at Lakeside, thanks to a tip from a friend in her congregation. The Green Corn Project is a local nonprofit organization that helps educate and assist Central Texans in building organic food gardens so that they can have access to nutritious, affordable food. 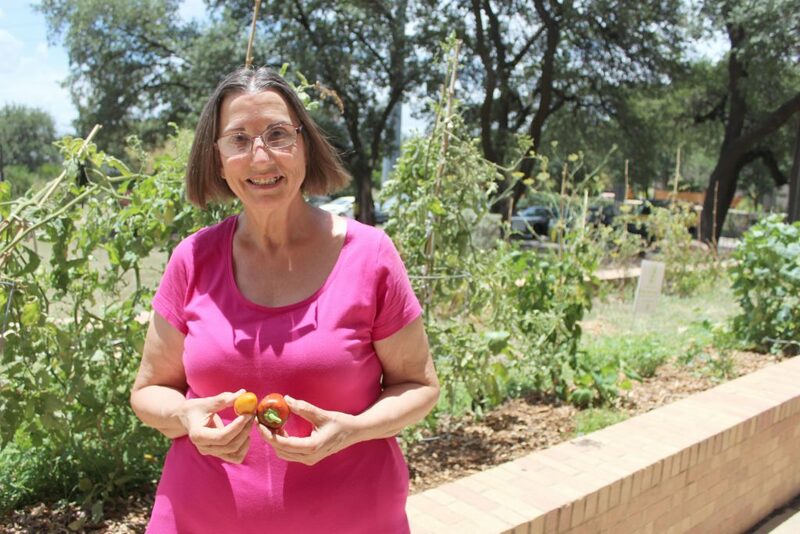 Since the raised Lakeside garden was planted by the Green Corn Project’s Dig-In Leaders in November, Dinah and two other Lakeside residents have established beds full of cucumbers, green beans, herbs, peppers, eggplant, Swiss chard. Marigolds scattered throughout the garden add a pop of color. For more information about the Green Corn Project, or to apply for your own free garden, visit www.greencornproject.org or call (512) 632-4541.